It’s considered chic to say culture is important to your organization, but is it really? 1. Do you have the skills to do the job? This makes sense. 2. Are you a good fit within the Zappos culture? Hsieh suggests that there are a number of highly-skilled and talented people who could likely make a positive impact regarding the Zappos bottom line who get passed over because they don’t appear to be a good cultural fit. Earlier this year I was at an event where Jeff Bezos was talking about some of the things they were doing at Amazon.com. Although he didn’t specifically talk about creating what would be considered a healthy culture, it was part of just about everything he talked about. He argues that there are two types of leaders, missionaries or mercenaries. He also suggested that contrary to popular belief, it’s the missionaries who win in the end. Let me explain. Missionaries have a mission and spend their efforts trying to inspire their employees and their customers with that mission. Zappos and Amazon are great examples of companies that do that. When employees get jazzed about doing something important (even if it’s just selling shoes or books), they step up and perform at a higher level, they volunteer, they’re invested in success. When all the business leader cares about is increasing the bottom line, employees and customers eventually find out that your only interest is to line your pockets and eventually jump ship. The challenge is to demonstrate to your employees and your customers that you take things like mission, values, and culture seriously. A few months ago, Patrick Morin, a brilliant sales executive and two-time turnaround CEO shared with me how he determines who to fire when he starts working with a new company and it’s a reflection of the value he places on those things. 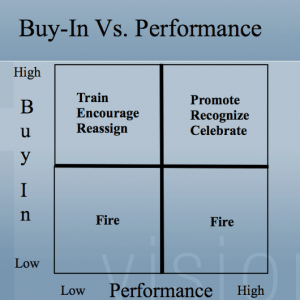 Firing the high performer with low buy-in does a number of things. It tells the rest of the company that culture matters more than the bottom line and inspires those with high buy-in to perform at their best. If the focus of your business is to solve market problems it’s critical that your employees are on board. After all, that’s where the rubber hits the road. 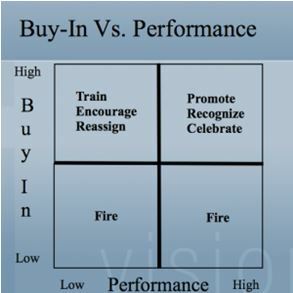 Morin would suggest high performing employees that buy-in to the culture should be those you promote and recognize. Their performance should be celebrated and shared with the rest of the organization. What’s more, they’re likely the employees who always step up when it’s crunch time and extra work needs to be done. Whether they’re in an official leadership position or not, they likely have a leadership roll on the team. I once worked with a colleague who was described as the heart and soul of the team. She wasn’t a senior member of the team, but her incredible attitude and abilities allowed her to take the lead in many situations. Her willingness to pitch in and fill whatever assignment she was given made her an incredibly valuable part of the team. She was a keeper I’d welcome on my team any day. With this type of model, do you think there’s any question about who to promote, who to make opportunities for, or who to “go to” when there’s a challenge to overcome? 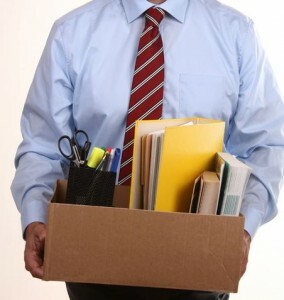 Finding and keeping the right people is a lot more complicated than simply not firing anyone. Sometimes you need to act with surgical precision to excise a cancerous employee, but there are other times an under-performing employee can rehab into a more meaningful role and a high performer. Is culture important to you? How do you find and keep the best employees?